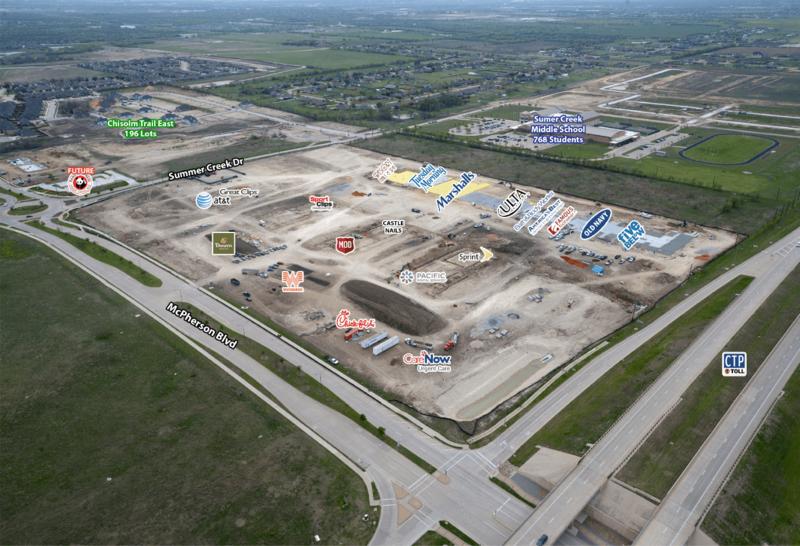 FORT WORTH – (Realty News Report) – Arch-Con Corporation is building the Shops at Chisholm Trail, a 35-acre retail development by Street Level Investments. The 215,000-SF power center, which will have a movie theater, is at the corner of Chisholm Trail Parkway and McPherson Boulevard in southwest Fort Worth. The center is in a high-growth area that also draws from the Cleburne community, said Marc MacConnell of Arch-Con’s retail division. The Shops at Chisholm Trail is part of a larger, master-planned community, adjacent to the Chisholm Trail Community Park, in one of the fastest growing areas in southwest Fort Worth. Once complete, the development will include multifamily living, single-family homes and retail options. The Shops at Chisholm Trail Ranch, classified as a regional retail, entertainment and dining destination includes 130,000-SF of premium, junior-anchor retail, a 40,000-SF movie theater, 44,000 SF of fast casual restaurants and convenience retail and eight outparcels. David Copeland and Brian Waxler with EDGE Realty are handling the leasing for the center. The tenants include Five Below, Old Navy, Famous Footwear, Ulta, Marshalls, Tuesday Morning, AT&T, Sprint, Great Clips, Sports Clips and Resort Nails & Spa. The project is scheduled to open in the spring of 2020.. Keith Bjerke, president of Bjerke Management Solutions, is the program manager. Houston-based Arch-Con has offices in Dallas and Los Angeles.